Here I am at age 14, on Christmas morning, in Winchester, Hampshire, England. I have opened all my gifts and I am wearing them. I was taught that you always dress immediately in anything you've been given as a gift to show how much you appreciate it. Thankfully, I liked the long-sleeved T-shirt because it came from my favorite shop, BIBA, which I'd visited with my mother in early December. I quite like the mini-skirt now, though I can't really remember it. Those very long socks were all the rage at the time; I think my sis gave them to me. 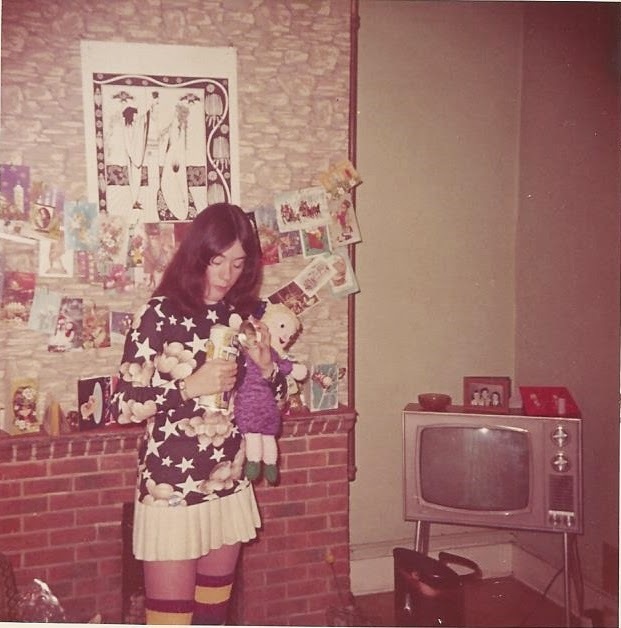 The rag-doll was from my mother so I'm holding her to show how much I like her. I am eating something I got in my Christmas stocking -- cookies, by the looks of it.